I notice i´m kind of monopolizing this forum with my boring threads and i´m sorry for that! I´m well aware N2yes did most of the threads and that Sound Chaser might not be very fond of me taking over this forum with all this threads, i also sorry for that. But i can´t help myself, i´ve been researching and discovering so much that i needed a place to vent all this information. Indeed is a YesTalk Forum but there´s this one place(When rock was young) that i feel confortable adressing such subjects. I don´t feel all that confortable in any other place(website), YESTALK is a very unique place, a different forum with very special people in! Italy gave birth in the 70´s to great rock n´roll bands among them the most notorious ones were the Progressive rock acts like: Le Orme, Premiata Forneria Marconi, Banco Del Mutuo Soccorso and Moseo Rosenbach. They were influenced by English Prog, specially King Crimson, ELP and YES. 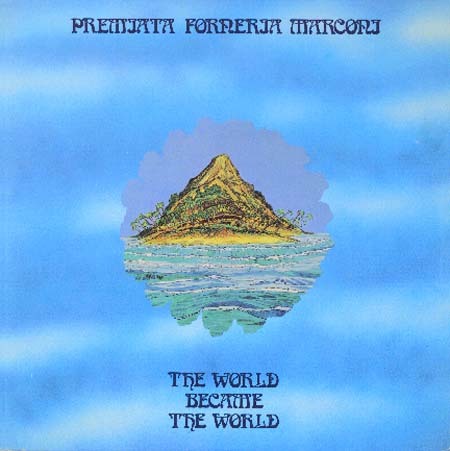 The list of italian bands doesn´t end here but the only one that really made it big and ended up becoming legendary Prog-rock was Premiata Forneria Marconi. The original core members of PFM (Mussida, Di Cioccio, Premoli, and Piazza) came together in the mid 1960's while playing together as backup musicians for many different Italian pop, rock and folk singers such as , , and [url=http://www.absoluteastronomy.com/topics/Fabrizio_De_André]Fabrizio De André[/url] . They appeared on many recordings for other artists during this period and quickly established themselves as top players on the Italian rock and pop scene. Mussida, Premoli, Piazza and Di Cioccio then formed the group "Quelli" in 1968. Quelli released one album and some successful Italian singles. Milan in 1970 when the members of Quelli met from the group Dalton. Pagani helped the group expand their sound to include violin and flute. By this time they were already highly experienced musicians and easily able to play the kind of complex progressive heavy rock played by the leading English and American groups. Their early live performances included covers by groups such as and . Other early influences included , Ekseption and . Brescia. However, producer and friend Alessandro Colombini suggested the name lacked something, so the title "Premiata" (award-winning) was added. Some objected that "Premiata Forneria Marconi" was too long a name, but the group's philosophy was clear: the more difficult to remember a band's name, the more difficult to forget it. and Mia Martini.Later in 1971 the group signed with the Numero Ono division of RCA Records in Italy and released their first single, Impressioni di settembre b/w La carrozza di Hans. It caused a sensation on the Italian charts and received wide recognition as the first Italian hit record to feature the sound of an electronic music synthesizer. Both songs are still regularly performed by the group. Flavio Premoli also did a special demonstration of the capabilities of the Mini Moog during a PFM television performance broadcast by RAI. 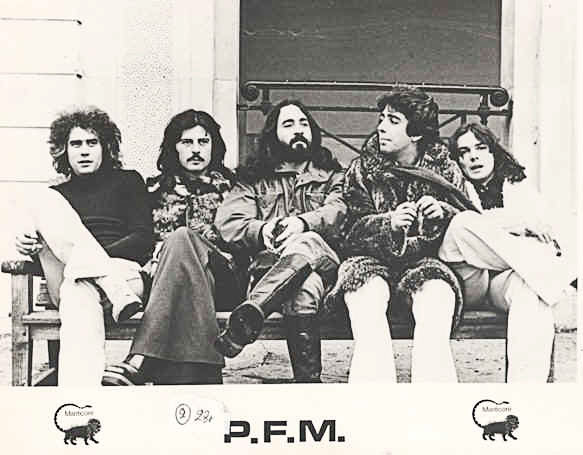 In early 1972, PFM released their first album Storia di un Minuto. The album topped the Italian charts after only one week and was the first album by an Italian rock group to achieve this kind of success. It contained re-recorded versions of songs from the first single, as well as É Festa and Dove... Quando... which continue to be essential parts of their live concerts. Later in 1972 saw the release of their second LP Per un Amico.This album opened the way to broader audience recognition all across Europe. It featured much better production and allowed the group continue to refine their special combination of symphonic classical and traditional Italian musical influences in a rock context. It is still one of their strongest albums. Many Progressive rock fans prefer the original Italian performances to the later re-recorded and re-mixed English Language versions. PFM came to the attention of Greg Lake of Emerson, Lake & Palmer during an Italian tour and PFM were signed to Manticore Records. The first album on Manticore(Photos of Ghosts) was released in late 1973. It contained mostly remakes of songs from Per un amico in English. New lyrics (not translations) were written for the album by former King Crimson Member Peter Sinfield who also helped produce the re-recording and mixing at Advision Studios in London. Photos of Ghosts was released all across Europe, Japan, and North America and represented the first real attempt by an Italian rock band to break into foreign markets. It was one of the first recordings by a European rock group to have significant chart success in the USA. The album also contained a new instrumental Old Rain, one song in Italian, Il Banchetto (The Banquet), as well as Celebration, (a remake of É Festa) which received considerable airplay on album oriented rock stations in the U.S.A and Canada. Following the release of Photos of Ghosts bass player Giorgio Piazza left the group and was replaced by Patrick Djivas, who has remained with the group ever since. The next PFM album release in Italy was L´Isola di Niente(1974).Highlights of the album include Dolcisima Maria (English title: Just Look Away) and the instrumental Via Lumiere (English title: Have Your Cake and Beat it.) Again a similar English language version of the album was released by Manticore as The World Became The World. The English album included another remake of Impressioni di Settembre as the title track. This would be their last collaboration with Peter Sinfield, as the group were not entirely pleased with the content of his English lyrics. Again, the English album reached the U.S. charts, but was not as successful as its predecessor. Following the release of The World Became The World the group recorded concerts in Cleveland, Ohio and Toronto, Ontario on their 1974 North American tour. These recordings were used for their next European album titled Live In USA. The same recordings were also released in the U.S. and Canada with new cover art as their final U.S. album for Manticore re-titled, Cook. PFM reached their biggest American audience yet when they appeared on NBC's Midnight Special program on February 21, 1975. Their nationally televised performance included Celebration and the instrumental Alta Loma Nine Till Five. The lack of a strong lead vocalist was the thing that had always been considered as the biggest liability for PFM, and so, for this reason, they enrolled Bernado Lanzetti who was previously with the group Aqua Fragile. Lanzetti had lived in the U.S. and could solve the vocal problems of PFM, due to his very powerful and distinctive voice. He could also sing and speak fluent English. However Lanzetti's somewhat grating vibrato did not appeal to everyone. He was sometimes compared unfavorably to Peter Gabriel, though he actually sounded more like Roger Chapman of the British group Family. The first release by the six-piece band was Chocolate Kings(1975).This had modest success at home but was their least popular album in Italy so far. It contained some very good songs such as the title track and Out of the Roundabout. Chocolate Kings features a harder rock sound and lost some of their Italian feel, while moving closer to foreign markets' taste. The same album was released with different cover art by Manticore in the U.K. and by Asylum Records in the U.S. The controversial U.S./U.K. cover showed a chocolate bar in a partially peeled Stars and Stripes wrapper on the front, along with the crumpled and discarded wrapper on the back. The album reached the U.K. Top 20 but was less successful internationally. Mauro Pagani left the group following Chocolate Kings to pursue a solo career. Lanzetti also appeared on Jet Lag(1977) an album highly influenced by the Jazz-fusion movement which was recorded in Los Angeles. This was their last album with English lyrics and their last attempt to reach the international Prog-rock audience. It was also their last album released in the U.S., also on Asylum. Violinist Gregory Bloch, previously with the group It´s a Beautiful Day , replaced Mauro Pagani but lasted for only one album. Paspartù (1978) added 2 new percussion players and changed direction again toward shorter songs in Italian with a unique and sophisticated international pop music style. The new sound on this album contains mostly acoustic instead of electric guitar and seemed to draw from Italian folk and Latin music as well as Jazz influenced groups like Steely Dan . This was the last album to feature Lanzetti. During the 1980s PFM enjoyed continued success at home while concentrating on commercial rock music for the mainstream Italian audience. In 1980 Flavio Premoli left the group and built a successful career writing and performing music for Italian films and television productions. Multi-instrumentalist Lucio Fabbri joined adding skills on keyboards, violin, and rhythm guitar. Albums during this period were Suonare Suonare (1980), Performance (1980), Come ti va in riva alla città (1981), and PFM? PFM! (1984). The group stopped performing in 1987 following the release of Miss Baker, although they never officially broke up. Recent recordings by the group have successfully integrated their mainstream Italian and Progressive rock styles. During this period PFM has produced much of their best work. The comeback album Ulisse (1997) was probably their strongest album since Chocolate Kings. It's success helped to bring them back to the attention of the international prog-rock audience. Ulisse is a concept album based on the Greek myth Ulysses with lyrics by Italian lyricist Vincenzo Incenzo. Flavio Premoli returned with the other 3 core members to produce one of their strongest lineups ever. An excellent 2 disc live album was recorded with additional musicians on their sellout Italian tour the next year. Since reformation the group has also recorded the studio album Serendipity(2001). Live in Japan2002 was released in both a 2 CD and DVD edition. The 2 CD edition contains 2 new studio tracks including a collaboration with Peter Hammill.Hammill wrote English lyrics and sings on the first recording in English since 1977, Sea of Memory. Piazza del Campo(2005) was released in a single CD and CD+DVD edition. Piazza Del Campo captures PFM's historic performance with the one time only return of Mauro Pagani.It was filmed outdoors in the gorgeous main square of Siena before thousands of enthusiastic fans. Italian rock star Piero Pelú also appears on the live DVD performance. PFM returned to the U.S.A for the first time since 1977 to play the Progressive Arts Showcase at Bethlehem, Pennsylvania on July 8, 2005. This concert was held in conjunction with the 7th annual NEARfest Progressive Rock event. Other shows on this tour included dates in Mexico, Panama and Venezuela. The latest releases are a rock musical version of Dracula (2005) and the entirely instrumental album Stati di immaginazione (2006). PFM is the first confirmed act for the NEARfest 2009 festival. I've yet to get my hands on the "original" releases of their first two albums (a bit pricey). But have enjoyed their catalog thru Jet Lag. Don't know what they did after that. But World Became the World has seen my turntable multiple of times. Found a link to a You Tube video of PFM not long ago of a performance on "The Old Grey Whitsle". These guys were amazing!